When I heard that Bradley Cooper and Lady Gaga were starring in a movie about music I was sold. I didn’t care if it was a remake or not – I was going to see it. After doing a little bit of research, I discovered that this was actually the fourth incarnation of A Star Is Born (I was only aware of the 1976 version with Kris Kristofferson and Barbara Streisand) but it was a different take. So be it. Bradley Cooper and Lady Gaga were going to be playing music together and I couldn’t wait. Last night we saw the highly-anticipated film and to say that it lived up to the hype is an incredible understatement. The searing guitar that opens the movie is about as exciting as an opening scene gets. It shows Cooper, as country rock singer Jackson “Jack” Maine (the perfect name for him), shredding his electric guitar with the kind of fervor exuded only by musicians so talented that they can play wasted and not miss a note. Maine, thrashing around with the best hair this side of my significant other, is shown playing with his band in front of thousands of fans (the audience scenes were actually filmed at Coachella). As soon as his set is over, he quickly leaves the stage, with his head down and his mane (see what I did there) under an Australian-looking cowboy hat, and rushes into the back of a town car where he immediately dives into a bottle of gin. Next thing we know he’s looking for another bar where he unexpectedly finds his musical muse and love of his life. Similar to Maine, Blake allowed his alcohol dependence ruin his career and personal life – but he has that charisma, both on and off stage, that Maine has as well. Some of the stuff that comes out of both characters’ mouths is so intrinsically funny that it’s debatable whether or not they know how funny they really are. In Crazy Heart, Blake writes a song in just a few short minutes while lying down on a hotel bed, strumming a guitar. His journalist/muse/lady friend asks him what song he’s singing, because she thinks she’s heard it before, only to realize that he had just written it a moment ago. And that’s exactly how I felt when I first heard Maine sing “Black Eyes.” Where have I heard this song before? I hadn’t – it’s just that good. And they’re all good. But it gets even better when Gaga’s Ally starts writing with Maine because their chemistry reaches through the screen, grabs the audience, and doesn’t let go. For the entire movie. It’s hard to believe that A Star Is Born marks Cooper’s directorial debut and Lady Gaga’s (real name Stefani Germanotta) first starring role. They are so sincere and true to each other’s characters it’s a pleasure to watch. As Gaga’s real-life story goes, before Germanotta became her alter ego Lady Gaga, she was a piano-playing singer/songwriter just like Ally so I’m sure she reached to her own experience for this character. In fact, for the rest of this review I’m going to refer to her as Germanotta because everything about her A Star Is Born character is stripped down to her authentic core. And that genuineness is prevalent throughout the entire movie: the gravely, road worn and weary voice on Maine, Ally’s honest reaction when Maine pulls her on stage for the first time, and Ally’s hilarious relationship with her father who is played brilliantly by the virtually unrecognizable and phenomenal Andrew Dice Clay, just to name a few. I believe everyone in this movie and that’s because each person was carefully chosen to play thoughtfully crafted characters. No fluff here. A few more people who have small but pivotal roles: Lukas Nelson plays guitar (he doesn’t have any lines) for Maine’s band and handled some of the songwriting behind the scenes. Sam Elliott, whose speaking voice is so legendary I want him to narrate my life, plays Maine’s brother with a compassionate ferocity. Although he doesn’t have much screen time, Dave Chapelle plays an old friend and is an extremely important part of Maine’s story. Additionally, the drag queen crew and Ally’s dad’s luxury car service crew are two very dynamic groups of people who are indisputably funny and greatly contribute to the plot. Although they are mostly on the outskirts of the plot, each of them absolutely elevate this movie. The original songs and storyline are integrated to perfection. Throughout the movie, I believed those songs were being written as I watched. Cooper is one of my favorites and the genuine love and loss in his eyes is unprecedented. The dialogue is as good as the music – in fact, the conversations are so real and the reasons behind the ways these characters think and act are so expertly fleshed out that the audience digs deep with them. There is so much under the radar humor that adds to the artistry of what I’m going as far as to say is a modern-day masterpiece. Sincerity is everything in this movie and I love that it is shot beautifully, thoughtfully, and from the eye of a musician. Also, Charlie the pup is the cutest and belongs to Cooper in real life. My one criticism is the shift Ally goes through when she transforms from soulful singer/songwriter to pop star. It’s so much like Germanotta’s own story and the main reason I wasn’t a fan for so many years. In fact, I wanted nothing to do with her or her Pokerface until I saw her play piano and belt the “Your Song/Speechless” medley with Elton John at the 2010 Grammys. 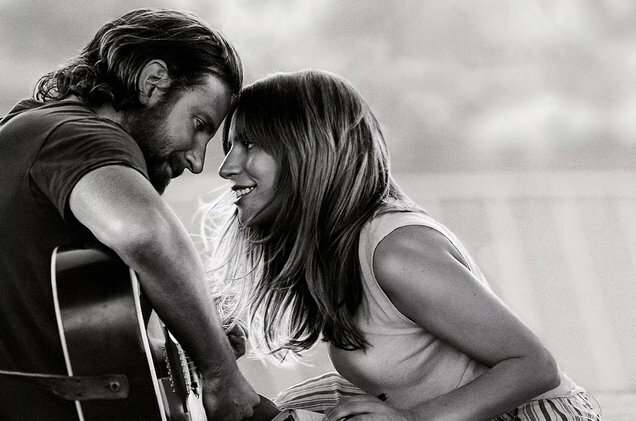 A Star Is Born marks the first time in a long time that a soundtrack with all original music is something to celebrate. In fact, the last soundtrack I bought might have been Crazy Heart. There is no question that this movie is going to resonate with a wide variety of people – music fans, people who believe in great love, and people who want to see what true bravery looks like. Relatable conversations between flawed people is ultimately what the movie-going experience is all about and Cooper and Germanotta make that happen for the entire two hours and fifteen minutes. While A Star Is Born is by no means a story of redemption, it is one of truth, tragedy, heartbreak, love, and the magic of music.